Anyone can get cancer. However, some populations experience an undue burden of cancer. The adverse impacts cancer has on different populations are known as cancer disparities. 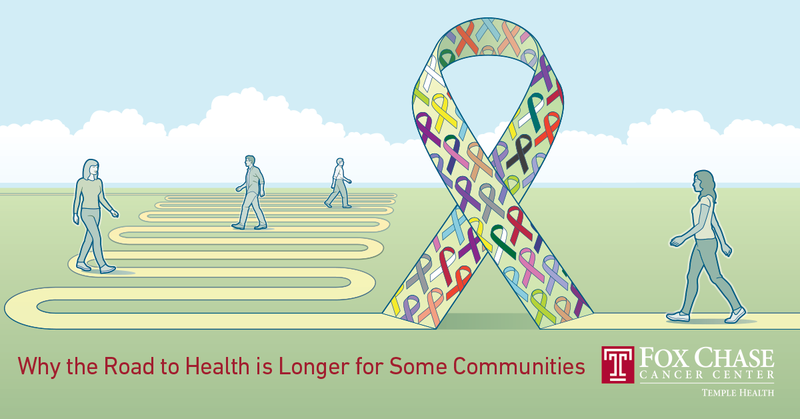 According to the National Cancer Institute (NCI), cancer disparities are differences in cancer statistics. These include new cases, screening rates, stage at diagnosis, and death. Cancer disparities can also be seen in cancer outcomes—some population groups may be steadily improving, while others are improving at lower rates or falling behind. “Typically, when people think of health disparities, they think of race and ethnicity. But there’s more to health disparities than race,” said Evelyn González, MA, senior director of community outreach at Fox Chase Cancer Center. What are some common disparities? People with lower socioeconomic status are more likely to die of cancer than people with higher status. This is true regardless of race or ethnicity. African American women are 40 percent more likely than white women to die of breast cancer. Hispanic and American Indian/Alaska Native women have higher rates of cervical cancer than other groups. However, African American women have the highest death rates from the disease. American Indians and Alaska Natives have the poorest 5-year survival rates. Colorectal cancer screening rates vary widely between ethnic groups. Spanish-speaking Hispanics are less likely to be screened than white or English-speaking Hispanic people. Hispanics have the highest number of cancers associated with infection, like liver, stomach, or cervical cancers. This data can be disheartening. But education can make an impact. How does Fox Chase combat disparities? A bilingual speakers’ bureau. Speakers from Fox Chase partner with community-based and faith-based institutions, educational institutions, and other organizations to deliver talks about cancer risks and screenings, and how to stay healthy. Sessions are available in both English and Spanish. Monthly education programs that focus on specific cancer-related topics, such as nutrition and coping with lymphedema. A Mobile Screening Unit, which travels to locations around the Greater Philadelphia region and screens for breast, and skin cancers. The Office of Community Outreach also provides a number of other free screening days throughout the year at various locations for head and neck cancer. Free smoking cessation services through the community Tobacco Treatment Program. The Office of Community Outreach works to inform and empower the community and reduce cancer disparities. Learn more about what services are available for you and your community here or by emailing outreach@fccc.edu.